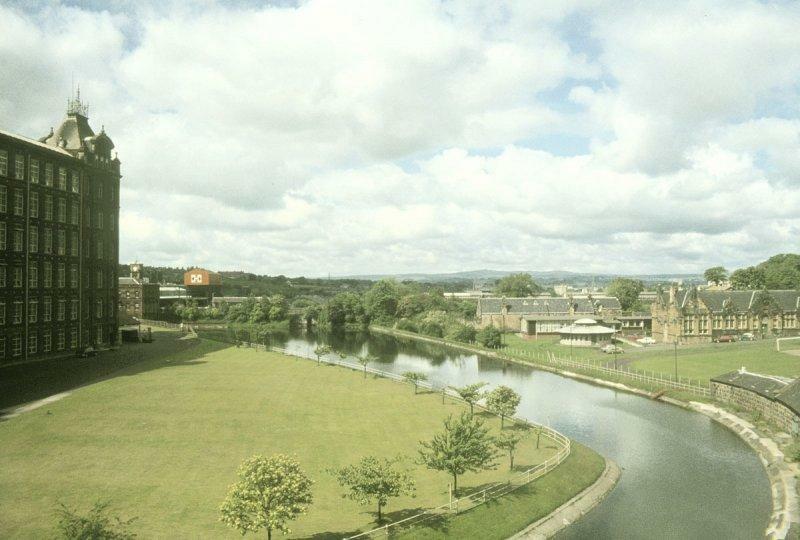 I thought that I knew all about the canal, I've lived near the Paisley site for some 25 years. I've ridden by train on the Glasgow to Paisley section and by foot & bike on the Paisley to Johnstone section. Little did I know. I knew nothing of Port Eglinton, I thought that the canal ran all the way to Lochwinnoch along the line of the cycle track. I'd heard of Robert Tannahill but did not know of his sad and early demise beneath it's murky waters. I'd always thought that the remaining part of the canal was actually the Canderen burn. I knew of the disaster on the canal but did not know the location. 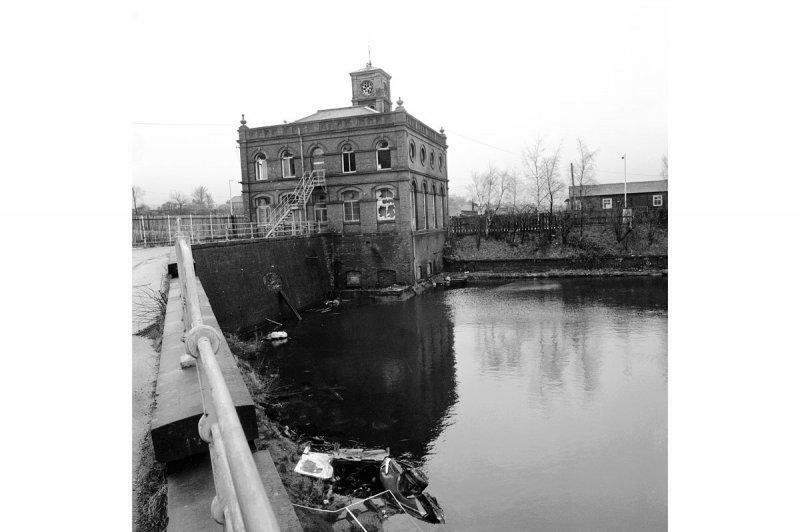 I'd seen the photo of Provost Clark on the banks of the canal but had never known exactly where it was taken. I new nothing of Telford's involvement or his aqueduct at Blackhall. In reality, I knew very little. Thank god for the Electrical Interweb. 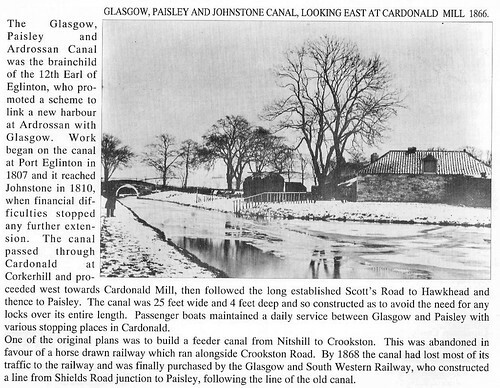 I'll set this out in four parts, the general history of the canal, the great disaster, the Canal then & now & the locations of interesting points along the route (photos throughout) If anyone can shed more light on the Port Eglinton or Johnstone parts, post up what you have, I could not find much without a visit to the Mitchell or Paisley Library & Museum (I'll save those trips for better weather) All comments / correction are most welcome. The short histories of the canal can be a bit repetitive, but each carries additional information & I wanted to keep the original sources clear. After seven centuries of ownership, the Montgomery family's finances floundered and Eaglesham Estate was put on the market in 1835. Hugh, 12th Earl of Eglinton promoted and partially funded theGlasgow, Paisley and Ardrossan Canal and Ardrossan Harbour projects. The Earl wanted to connect the booming industrial towns of Glasgow, Paisley and Johnstone to his new deep sea port at Ardrossan and his Ayrshire coal fields. 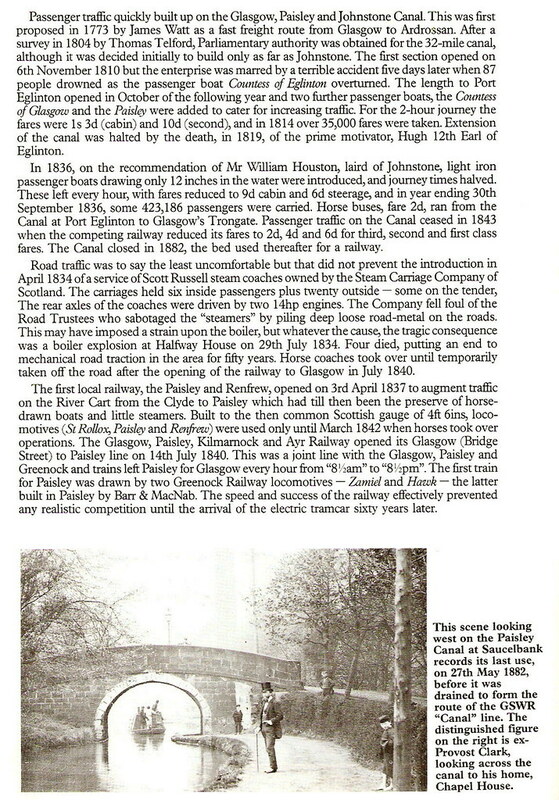 However funds ran out and the canal was only constructed from Glasgow to Johnstone via Paisley. 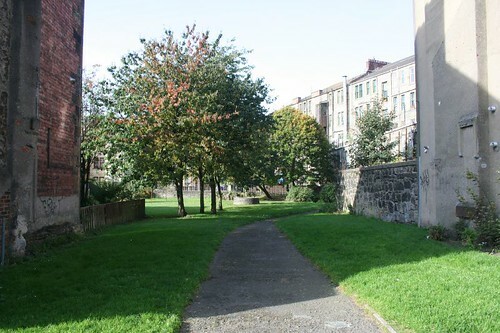 was originally called Marlborough Street, but at the opening of the Paisley and Johnstone Canal, of which concern the Earl of Eglinton was chairman, the name was changed. passing near the important manufacturing town of Paisley. A new survey of the line was made, and the works were carried on during several successive years until a very fine capacious canal was completed, on the same level, as far as Paisley and Johnstown. and the canal was carried no further. Besides, the measures adopted by the Clyde Trustees to deepen the bed of that river and enable ships of large burden to pass up as high as Glasgow, had proved so successful that the ultimate extension of the canal to Ardrossan was no longer deemed necessary, and the prosecution of the work was accordingly abandoned. January 1800	William Jessop,	It was reported that he was employed to report on the scheme. January 1800	John Rennie, He made a survey, plan and report on Saltcoats Harbour and gave his authority to the canal scheme. October 1804	John Rennie, He reported on the route estimating that a canal for vessels of 25 tons would cost £130,960 or £166,711 if 60-ton vessels were to be used. February 1805	Thomas Telford, He produced a report recommending a 32 mile canal from Tradeston to a new harbour to be built at Eglinton on Ardrossen Bay with a branch to Salcoats. There was to be an 18 mile summit and the total estimated cost was £134,500. August 1805	Thomas Telford, A meeting in Paisley approved his plan and decided to apply for an Act of parliament. 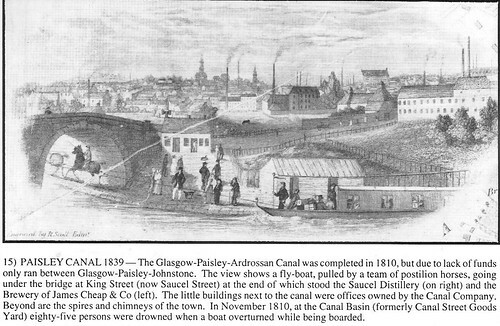 January 1806	Authorised by the Glasgow, Paisley & Ardrossan Canal Act. 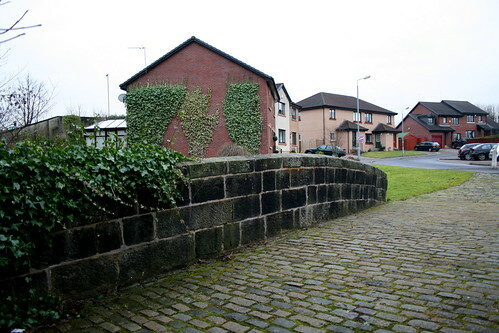 Between Paisley West and Elderslie, the line of the railway deviated slightly from the original line of the Glasgow, Paisley and Johnstone canal; a former loop in the canal was used to hold cooling water for the cotton thread mills at Ferguslie. 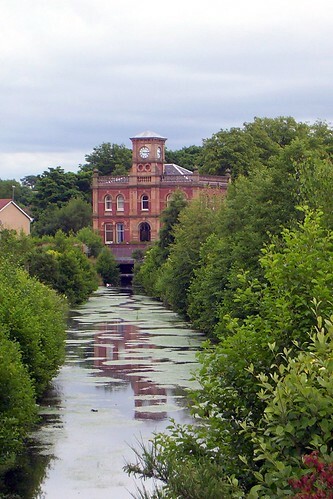 Glasgow, Paisley, and Ardrossan Canal.—The expense of land-carriage from Glasgow to the west coast through the fertile counties of Renfrew, and Ayr, abounding with coal and limestone, suggested a water conveyance. The operations on the canal commenced in May 1807, and the navigation opened between Glasgow and Johnstone on the 4th of October 1811. Although the canal was opened at that period, the trade did not commence till April 1812. The length of the canal from Port Eglinton to Ardrossan is 32½ miles, from Port Eglinton to Johnstone 11 miles, breadth at top 30 feet, at bottom 18. feet, and depth 4 feet 6 inches. There are no locks on that part of the canal yet executed, viz. between Port Eglinton and Johnstone; but when the canal is carried forward, there will be eight near Johnstone to raise the canal to the summit level, and thirteen to fall down to the harbour of Ardrossan. On the 6th of November 1810, passage-boats were put on this canal; but Mr William Houston, of Johnstone Castle, has the merit of introducing swift iron boats. The great increase of passengers may be seen from the following statement. 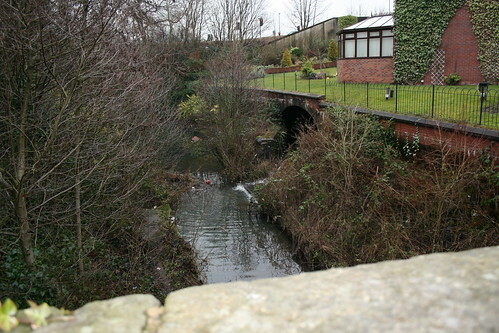 Little remains of the Glasgow, Paisley and Johnstone Canal, (originally named the Glasgow, Paisley and Ardrossan Canal) which extended for 11 miles (17 km) from Johnstone to Port Eglinton. 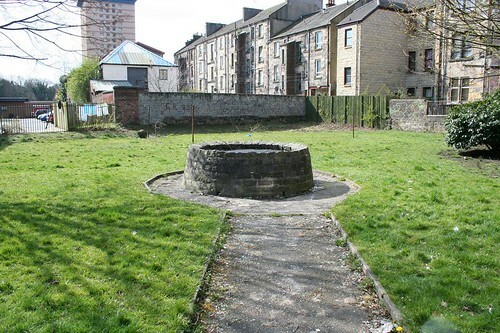 Neither the Johnstone or Port Eglinton basins still exist; the former lay next to Canal Road, just northwest of Johnstone railway station while the latter lay close to Eglinton Street, a half-mile (1 km) south of Glasgow Bridge. The canal transported a range of raw materials and finished good, such as coal, ironstone, bricks, slates timber, grain and textiles. Passenger traffic was also significant and novel express passenger boats were brought into service in 1830, pulled by six horses. This service carried up to 400,000 passengers each year and continued until the opening of the railways. The canal was taken over by the Glasgow and South Western Railway Company in 1869 and was eventually closed by Act of Parliament in 1881. 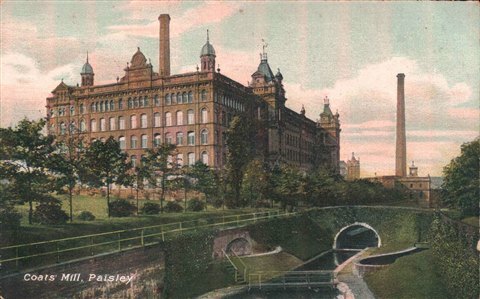 In that year a railway track was laid along the section between Glasgow and Paisley, a route now linking Glasgow Central to Paisley Canal station. 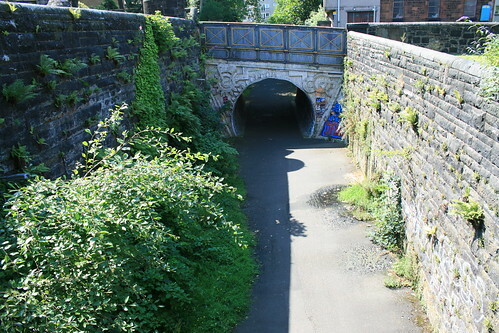 The Blackhall Aqueduct survives as a railway bridge, but it is in the environs of the Ferguslie Thread Works in Paisley that the canal is best preserved. An engraving showing a passenger packet boat pulled by two horses with postillion riders near Paisley, on the Paisley Canal in 1849. 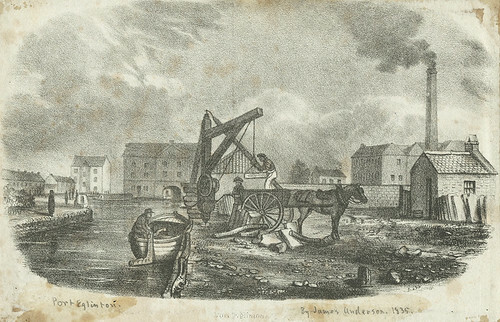 Mr. John Boulton, who had been brought up as a millwright, removed to Ashton in 1830, having obtained the management of the Flash Hall Mills there. His stay was brief, however, as in 1833 he was appointed to a more important post at Middleton. In 1835 he came again to Ashton as partner in Peter Platt & Co. In 1839 he took over the Egret Mills, but this enterprise ended in disaster and the loss of all his savings. In this dilemma Mr. John showed himself a man of initiative and energy. 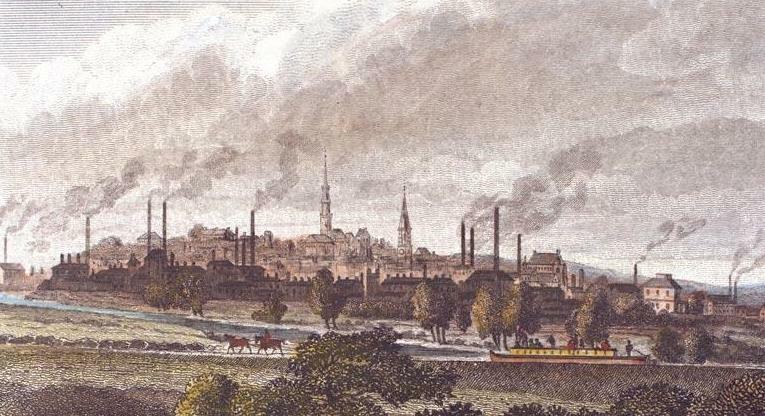 On the opening of the Sheffield, Ashton and Manchester Railway in 1841 it soon became evident that a considerable traffic must spring up between Ashton and Guide Bridge in connection with the new route and Mr.John succeeded in raising sufficient capital to put a number of horse-drawn passenger boats on the canal between those places, and this time his enterprise was rewarded with success. The packet- boats, as they were called, "went' and soon became prize ones. Later on Mr. John established a similar Service on the Peak Forest Canal between Dog Lane Station, Dukinfield, on the S.A. & M.R. and Marple and Macclesfield, a distance of some twenty miles, for which undertaking he purchased six or seven of the disused passenger boats of the Glasgow and Paisley Canal, then recently turned into a railway. These boats, which were 75ft. long and 6ft. 6in. 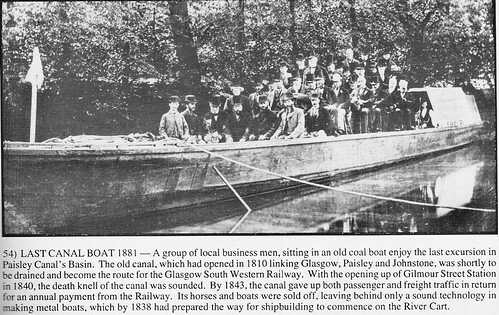 beam, carried one hundred passengers and travelled at eight to ten miles an hour, made several trips a day. .
Methodism may have begun to flourish in Paisley from 1807 when English workmen came to build the canal. I have a letter written from Tillicoultry on Nov. 20, 1849, by Daniel Murray to his brother Alexander -- my great, great, great grandfather -- who lived in Grenville Township, Quebec, Canada. I am trying to determine the significance of the fact that Daniel was writing from Tillicoultry. As far as I know, this family of Murrays had no connection to Tillicoultry, but I could be quite wrong. Oral tradition holds that the family was descended from the Murrays of Atholl. The earliest information that I have is the birth of the first son of John Murray and Mary Cameron, named John, born 1787 in Camlachie, Glasgow. 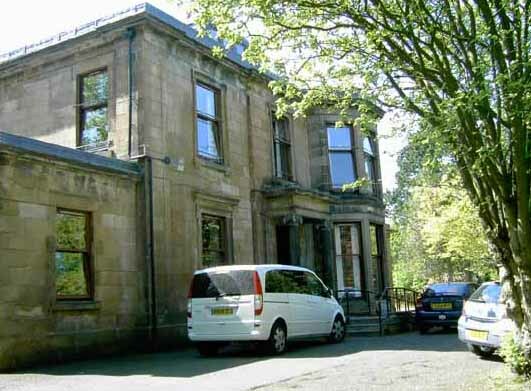 Their second son, Alexander, was born in Anderston, Glasgow, in 1788. John senior worked on various canals -- Crinan, Caledonian and Glasgow, Paisley & Johnstone -- as a labourer or possibly as a stonemason. Their family consisted of some eight sons and one or two daughters, with Daniel born in c.1801. From the letter it is clear that Daniel and his two sons were weavers and that the weaving trade was not prospering in 1849. I understand that Tillicoultry was a weaving centre in the 19th century, so this may explain why Daniel was there. I assume that weavers worked in their own homes at that time, hence my interest in the physical location of the return address. However, it is also interesting to note that one of the provosts of Tillicoultry was a Murray. I would be very grateful for any information or comments that you may have on the above. 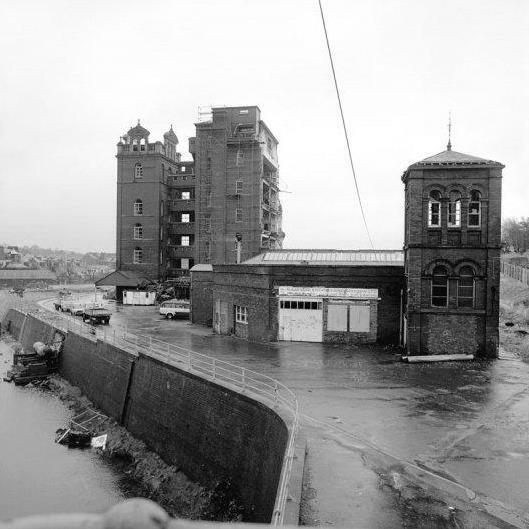 Port Eglinton was the terminus of the Glasgow-Paisley-Ardrossan Canal. 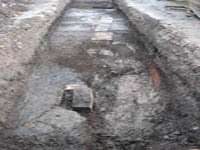 Visible are the remains of the canal wharf wall running diagonally across the trench. 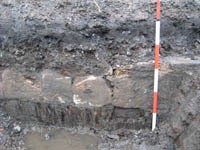 A detail from the base of the canal wall. It would appear that timber piles were driven into the ground and the stone wall was constructed on top of the piles. 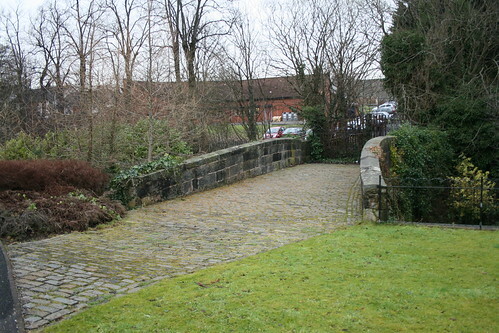 The bridge over the River Cart is the oldest railway bridge in the world still used by trains. It was built by Thomas Telford in 1810 and originally carried the Canal. 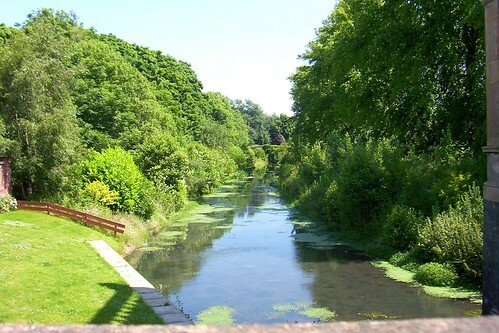 The canal was opened as far as this basin in October 1810. In 1820 stables were built in the vicinity at a cost of £120 and in 1832 a shed (NS46SW 193.15) was built for the gig-boat. This terminal basin, in the SE corner of Johnstone, is clearly shown on the 1st edition of the OS 6-inch map (Renfrewshire 1863, sheet xi). The location of this basin is still visible on the 2nd edition of the OS 6-inch map (Renfrewshire 1898, sheet xiNE). The location of the stables cannot be determined from the maps. Last edited by HollowHorn on Mon Jan 25, 2010 11:33 pm, edited 1 time in total. I've decided to post this article in it's entirety for two reasons, firstly it is such a fascinating and detailed account of the disaster & secondly because the original is too difficult to read. Given that this event occurred just 5 days after the first section of the canal opened, it is a wonder that it ever reached completion.
. By this measure, however, the boat made to heel, and the motion thereby occasioned, caused the people on deck to stagger, and shift towards one side. This fatal movement giving an additional impulse to the heeling of the boat, she was instantly over balanced, and more than two hundred people, by whom the deck was crowded, were at once thrown into the water. The boat immediately righted, and a few persons who happened to be seated in the cabin, or in the bow and stem, stilt kept their places. But the basin presented an awful and melancholy spectacle—upwards of two hundred human beings plunged into the water, and crowded together in a manner which made even their struggles for life increase the peril of their situation, and prove to many the occasion of death '. Although this disastrous event happened in the presence of many hundred spectators, it was difficult to render immediate or effectual assistance. For a moment the horror of the scene overwhelmed the beholders, and rendered them motionless—but instantly recovering themselves, every nerve vas strained to rescue their fellow creatures from a watery grave. But here a serious difficulty presented itself. The crowd of spectators was assembled on the northern side of the canal, where the height of the wharf prevented their immediate access to the water, and rendered it difficult, without ropes or hooks, to reach any of the unfortunate objects now ready to perish, almost within their grasp. While some of the crowd ran off to procure ropes, creepers, boards, and other useful implements, others rushed into the boat, in hopes of saving some by dragging them up the side of the vessel; but tln-ir eagerness to accomplish this object, had almost proved fatal to themselves, for by crowding all to one side of the boat, they had nearly occasioned a repetition of the fatal accident, and but for the actions of Mr. Barclay, from the opposite side, and othw who observed the danger, it is probable that a second disaster, similar to the first, would have been added to tin- horrors of this calamitous scene. By the exertions of Mr. Jauueson, and others on the wharf, the boat was made fast with ropes, and great numbers of bodies, many of whom exhibited signs of life, or were afterwards recovered were drawn up by the cabin top or windows. In the meantime, the two boatmen and several other (The water in the basin is about eight feet deep) persons who were thrown into the water, had gained the opposite tank, where, with such of the spectators as had got round by the bridges, they joined Mi. Barclay in most active and useful exertions, to save the lives of those who floated within their reach. Lawrence Hilt, an old man, and one or two other persons, who could swim, stripped and went into the water, where they succeeded in rescuing many from the death that threatened them. By the people in the boat too, and on both tides of the basin, the utmost activity was displayed in picking up bodies and conveying them ashore, while others , with equal activity, carried them off to the neighbouring houses, To the credit of the inhabitants residing at that part of the town it must be mentioned, that every house was open to receive them, and all the useful materials their owners possessed, were at the service of the medical gentlemen or others employed in the process of resuscitation. A vast crowd was collected from all parts of the town—every heart seemed interested—every hand was ready to lend assistance. The result was, that the lives of about one hundred and twenty persons were saved—a few having gained the bank by their own exertions—a number being brought out alive by the activity of the people, and many, in whom animation was suspended, having been afterwards recovered~ Eighty-five persons in nil were drowned, many of whom, there ii no doubt, lost their lives in consequence of receiving contusions , or of being pressed down in the water by those who fell above them, or entangled with, those that floated around them. Having thus attempted, says the writer of the report, to give some account of the accident itself, it now remains that something should be said respecting the services performed by particular individuals. In general, the exertions of individuals were such as had for their object, either to prevent the accident; or when it did happen, to rescue the bodies from the water—to restore suspended animation, or to assist by every accommodation, those who were so employed. On all these grounds, the merit of Robert Barclay, Esq: was most eminently conspicuous, and entitles him to the gratitude of every lover of humanity. When the boat arrived from Johnstone, he was in front of his own house, above the basin and quickly perceiving the danger to be apprehended from the number and turbulence of the crowd then collected in waiting for the vessel, he ran down to the bank of the canal, using every endeavour, by his cries and gestures, to warn them of the risk they incurred by rushing tumultuously into the boat. When the fatal accident happened he was most extensively useful, by his presence of mind, his personal exertions, and his influence with others, in extricating numbers alive from the water. While so engaged, a child, apparently dead, was committed to his care, which he immediately carried to Peter Wright's house, and never quitted till he had succeeded in restoring animation. His own house was thrown open for the reception of bodies, and whatever it contained that could be useful, was cheerfully furnished. He attended in person, to give every assistance in his power, while all the members of his family joined in these Immune and benevolent attentions. They enjoyed the satisfaction of seeing their services prove signally useful, and the blessings of many that wore ready to perish have come upon them. who, after swimming ashore to save Iris own life, stripped and brought out six others, till, checked by the cold, he was obliged to be assisted himself." After mentioning the names and services of ten other individuals, who distinguished themselves by their activity and usefulness, the reporter continues.
" To the medical gentlemen, in particular, much praise is due, for the superior manner in which they conducted their professional operations—for the coolness, ability, and judgement they displayed, amidst such a scene of embarrassment and complicated distress—and to the relations of those that perished, it must be a consolatory reflection, that no means which skill could devise, or humanity dictate, were left untried for their restoration, while in any case there remained a ray of hope, or even a shadow of doubt. And it is well known, that to the exertions made in this department, was owing the preservation of many a life on that memorable, but fatal occasion. I cannot quit this part of the detail without mentioning a particular fact, which I trust will not be considered as irrelevant A short time previous to this accident, a very interesting paper, on the means of restoring suspended animation, was read by Dr. Kerr, at the Philosophical Institution, which was followed by a discussion wherein several medical gentlemen took a part. It so happened, that several other gentlemen, who attended this discussion, were present at the fatal catastrophe which soon followed; and, by a prompt use of the means then recommended and illustrated, they had the happiness of seeing them successful in their own hands. Thus, by a liberal communication of useful information, have the medical gentlemen of Paisley, on this, and on other occasions, rendered the most essential services to humanity. I regret that it has not been possible to procure the names of all those individuals, who, disregarding fatigue or danger, exerted themselves with zeal and success on this mournful occasion. I doubt not, that several cases of distinguished merit must therefore remain unrecorded, but the persons to whom such merit belongs , cannot miss their reward, in the pleasing consciousness of having discharged, successfully, some of the most noble duties of humanity. Indeed, where such a number of persons were actively employed, in the various departments of usefulness, it would be difficult to discriminate. One spirit seemed to actuate the whole; the desire of doing good, was every where predominant, and the best proof of the zealous exertions made by all is to be found in the number of lives saved. It is indeed a. melancholy fact, that eighty-five persons perished; but when we consider the peculiar circumstances in which this disaster took place, it is rather a matter of surprise that so in any were saved. The names of at least two hundred and one persons are known, who were on deck and went down into the water when the boat overset. I believe two or three clung to the vessel and came up with her when she righted. But allowing for such omissions in the list, as may be expected in a case of this kind, there is reason to believe, that the number saved, nearly approached, if it did not exceed one hundred and twenty, as mentioned in the preceding narrative. in everything respecting the navigation and conduct of a vessel, the orders of the master ought to be punctually obeyed. On the 12th of November, there was held a meeting of the principal inhabitants, with a view of adopting such measures as should appear most expedient for alleviating the pressure of this direful visitation. The following minute of the meeting is extracted from the record which has been politely furnished me by Mr. Gibson, town clerk of Paisley, who acted as secretary to the committee. At a meeting of gentlemen resident in the town of Paisley and neighbourhood, assembled by request of the magistrates, for the purpose of considering the expediency and necessity of obtaining subscriptions for relief of the indigent and distressed relatives of many of the persons who unfortunately perished in the Basin of the Glasgow, Paisley, and Ardrossan Canal, on Saturday the 10th current. John Davidson, Esq; chief magistrate, in the chair. It was the united sentiment of the gentlemen present, that the deplorable accident which bad occasioned this meeting, unparalleled in this quarter of the country, and which must have plunged numerous families and individual* into indescribable misery and distress, demanded the most prompt and decisive measures for their immediate alleviation. That subscriptions for this humane and benevolent object, shall be immediately procured, not only in the town of Paisley and immediate neighbourhood, but also in the towns and villages around, the magnitude of the affliction and misery resulting from the lamentable catastrophe, being such as to require the aid of the benevolent in every corner of the neighbouring districts.
" That said committee be empowered to assume such gentlemen into management with them, as they may ascertain to be well fitted for communicating information relative to the distress of families and individuals, for whose relief the subscriptions are intended.
" That, for the satisfaction of the subscribers, the committee of management shall, at a convenient period, report the amount of the funds subscribed and the appropriation of them, and should there be a surplus of money procured on this occasion, that the committee be authorised to apply it for such charitable purposes as they shall deem most suitable. * This account was drawn up by Mr. David Wallace, to whose information and judgment, I am indebted in some other instances.
" That Mr. James Sym be treasurer, and Mr. Gibson secretary to the committee." The following short but comprehensive and satisfactory view of the proceedings of the committee, has been drawn up and communicated by Mr. Gibson.
" On no occasion did any committee manifest greater assiduity in behalf of suffering humanity, and in no instance were the benevolent affections more laudably and seasonably exercised. By private donations , individual subscriptions, and public collections, a fund of £.1013, 16s was in a few days secured, and donations from London, Dublin, and Edinburgh, were politely declined : the committee, from proper feeling, deeming it wrong to accept of benefactions when the money previously obtained was judged commensurate. In the end of 1810, there was published a small Tract entitled, " Reflections on the late Dreadful Catastrophe, which happened at the Canal Basin at Paisley," by an Inhabitant of Paisley. From its being anonymous, the tract, perhaps, met with less notice than it deserved. It contains some reasonable and just observations on the doctrine 'of Providence, and on the lessons which such an event as that described is calculated and designed to teach. Appended to the tract, there is a proposal for the erection of a society for suppression of vice and reformation of manners. A society with this title has existed in Paisley for more than half a century, and has done much good ; but its modest and unobtrusive character had prevented even its existence from being known to the author. One of the chief obstacles in its way, is the want of the requisite means of punishing offenders—a want which we hope will soon be supplied by the county Bridewell at present erecting. The author of this tract was Mr. George Robertson, then Pastor of the Independent Church, Paisley, now in Kirkwall. Barclay Street is shown on the north side of the canal (I wonder if it was named after him in recognition of his heroic efforts on the day) On another map, the lands to the south of the basin also belong to a Mr. Barclay. I have seen no evidence to suggest that the accident did not occur at this very spot. Last edited by HollowHorn on Mon Jan 25, 2010 11:38 pm, edited 4 times in total. This last remaining section of the Canal has been protected against the threat of removal and conserved for the foreseeable future. The water level within the level has been lowered, creating a more viable habitat for wildlife. 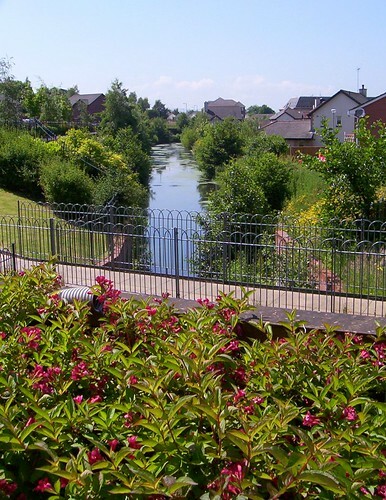 The canal basin has been enhanced as an attractive open water habitat within a residential area, with natural fringes to enhance its biodiversity and nature conservation interest. Counting House at centre & Gate House at upper centre. Behind the Counting House, Tannahill's Bridge can just be glimpsed, more on this in the next part. The Counting House straddles the canal & is built on stilts. Mystery and intrigue has long surrounded the slaying of the so-called witches in the 17th century. The four women and three men were strangled at the stake on the Gallow Green in the West End of Paisley and then had their bodies burned on a blazing bonfire. Afterwards, their charred remains were buried at Maxwellton Cross at a site marked by a horseshoe and circle of cobbled stones. 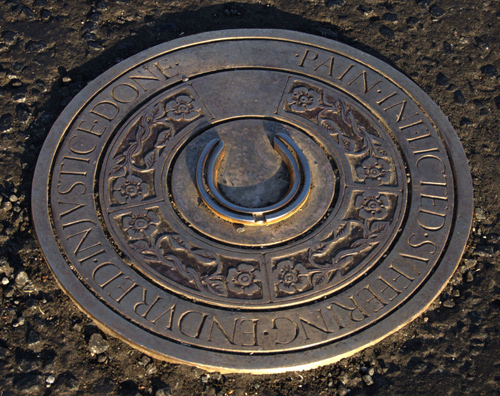 Now the Paisley Development Trust has unveiled a fresh tribute at the site in the shape of a stainless steel and bronze horseshoe piece sculpted by the town’s most famous craftsman, Sandy Stoddard. 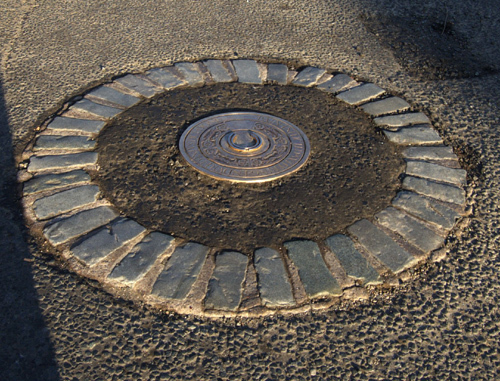 The tondo – a Renaissance term for a circular work of art – sits in the middle of the busy junction at Maxwellton Street and George Street and includes the inscription ‘Pain Inflicted, Suffering Endured, Injustice Done’. On a small patch of land, just off Queen Street in the West End, lies this well which is all that remains of the Gallowgreen. 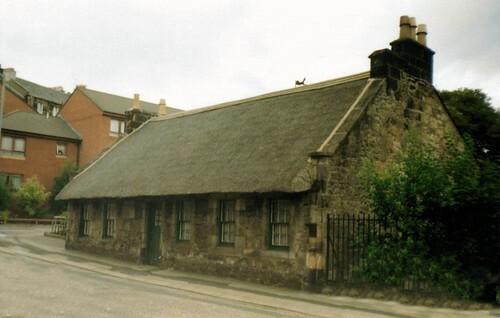 Also on Queen Street is the house where Robert Tannahill was brought up and where he worked as a weaver. The cottage was badly damaged by fire some years ago - the main casualty being the loss of the thatched roof. 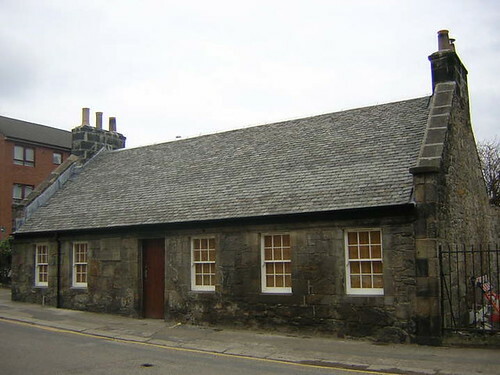 The cotage is still in use today as the meeting place for the Paisley Burns Club. Poet, flautist and song-writer. Born in Paisley, the son of a weaver, he received a good education for the time. At the age of 12, Tannahill became an apprentice to his father. He taught himself to play the flute and began to compose songs as he worked. 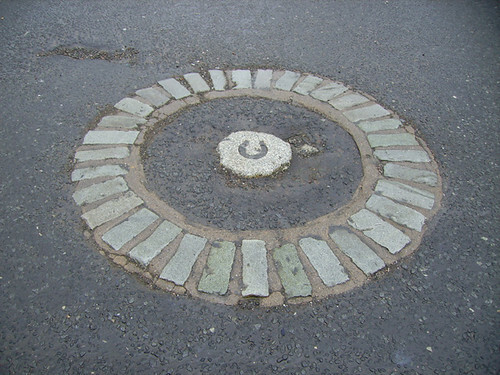 Inspired by Robert Burns' work Tam o' Shanter, Tannahill walked to Alloway Kirk in 1794 and spent time visiting the localities connected with the poet. 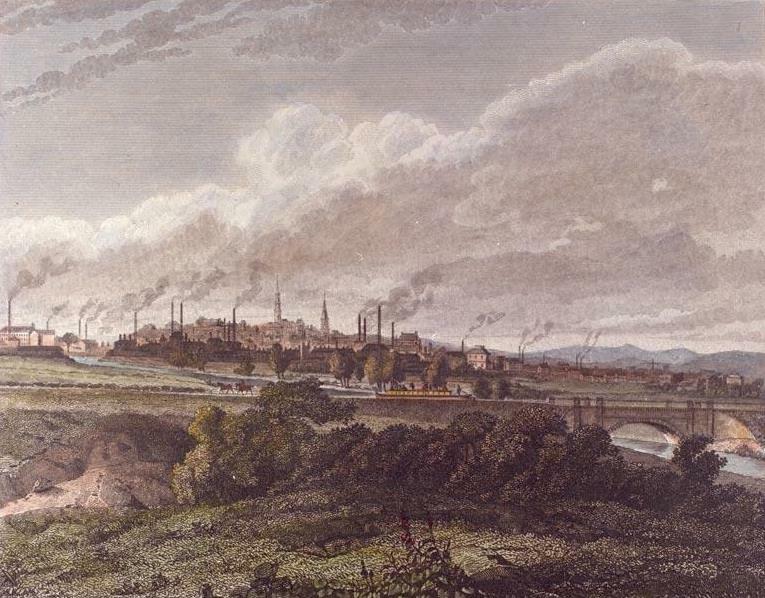 An economic down-turn caused him to move to Bolton (England) in 1799, but he returned to Paisley in 1801 on hearing of the illness of his father. He set up one of the first Burns' Clubs in the town in 1805. Tannahill's first and only publication,Poems and Songs (1807), proved popular, selling out within weeks. His best known songs are perhaps "The Braes o' Balquhidder", "Braes o' Gleniffer", "O are ye sleepin, Maggie" and "Jessie the Flower o' Dunblane". 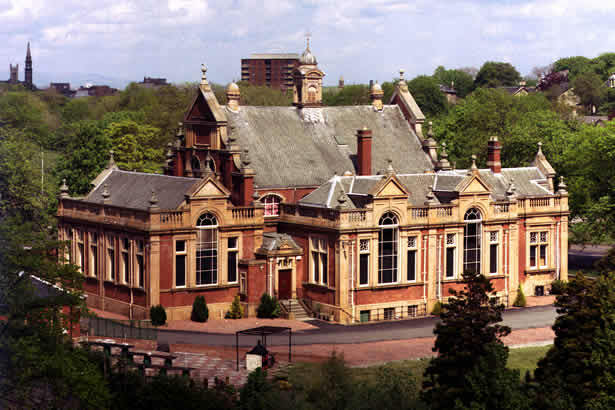 Tannahill enjoyed the theatre, attending regularly in Paisley and occasionally travelling to Glasgow. Gaining recognition throughout Scotland, he was visited by James Hogg (1770 - 1835), the 'Ettrick Shepherd', in 1810. 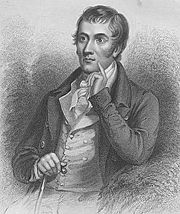 Prone to depression, when a second set of poems were rejected first by a Greenock publisher and then by Archibald Constable in Edinburgh, Tannahill drowned himself in the Glasgow, Paisley and Johnstone Canal. He is remembered by a statue in his home town and the Paisley Tannahill Club still meet in the house in Queen Street where he was brought up. 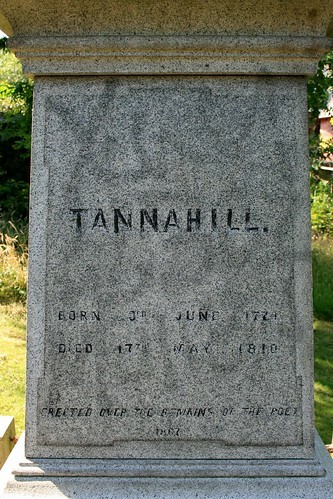 Tannahill was prone to bouts of depression and after his second volume of works was rejected by publishers, first in Greenock, and then in Edinburgh in 1810, he burned almost all of his own manuscripts before drowning himself in the Glasgow, Paisley and Johnstone Canal. It should be noted that the canal ran past the foot (more or less) his house in Queen St. I do not know as yet whether he threw himself in at that point and his body floated to where it was found or whether he in fact leapt from the bridge, hopefully a visit to the library may give more precise details. On May 17, 1810, aged just 35, he was found dead in a culvert at the Candren Burn in Paisley. 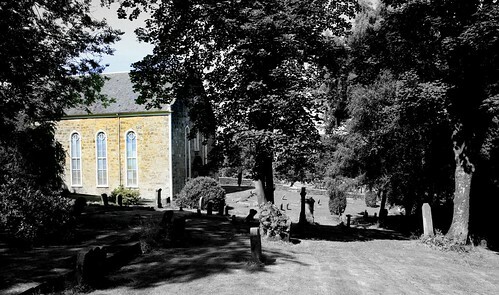 His remains were interred in an unmarked grave in the burying ground adjacent to the West Relief Church – now Castlehead Church – as suicide was considered a sin. The church and graveyard sit on the banks of what was once the canal, indeed, the steps leading to the church actually cross above it. The church also lies (more or less) at the foot of Queen Street, where Tannahill resided. The canal lies just behind the church & Queen Street just beyond that across Canal St.
John Wilson, the maternal great-grandfather of US President Ronald Reagan, was born in Paisley in 1812. The former President visited Paisley in 1991 and attended a service at Castlehead church, where some of his Scottish ancestors were married and are buried. Pee ess....I still have a nagging thought that Tannahill actually drowned himself in the Canderen Burn and that his body was carried by those waters to the Paisley canal, time will tell. and service answer a few street name questions also. Great work ! I knew the line used to be a canal and the Bob Tannahill topped himself in it but I didn't imagine that it went all the way to Ardrossan. I'm not sure where I though it went but that's another matter. This line did carry traffic round the top of the Stanely Resevoir and at some point joined the Potters Bar line which joined Paisley and Barrhead. 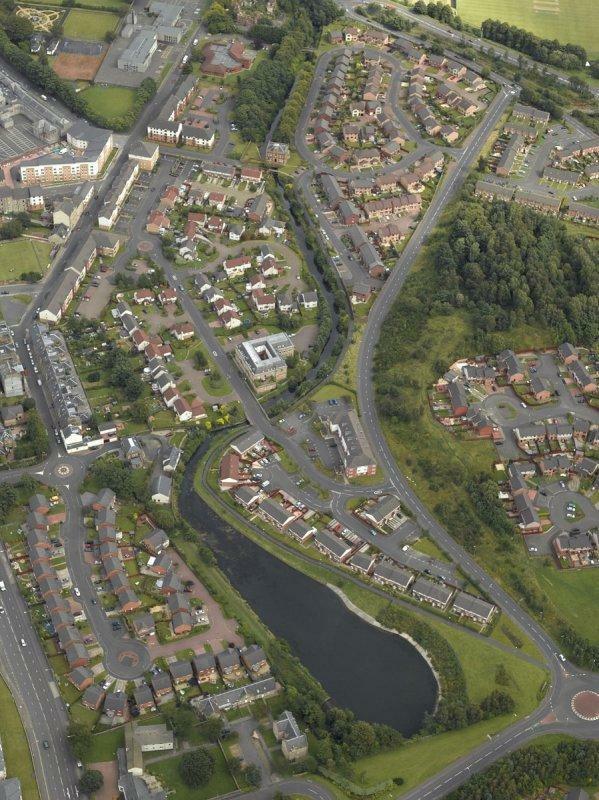 These lines are partially walkable but alot have had to give way to progress in the housing market in Paisley. I used to live near the Counting House when I was a boy. The mills were still in situ and my brother and I photographed them extensively. We didn't do the Balfour Beatty yard which is now housing but the mills were done. I'll give my bro a nudge for the photo's. It was ashame to see them go, they weren't in bad nick considering the ease of access. Dave wrote: but I didn't imagine that it went all the way to Ardrossan. The money ran out, Dave, so it ended at Johnstone. I live 10 mins walk from the old Mills & remember the 'Balfour Beatty yard' well. I'd love to see those photos. You really should come for a wander around the new estate, it's well worth a visit, give me a shout. Get some 'Past / Presents' in. Right-ho 10-4 on the length of the canal, I do now remember reading up on where it went to. I guess hooking up with Ardrossan would have made fiscal sense in the day but I'm reckoning time caught up and 'better things' came along. 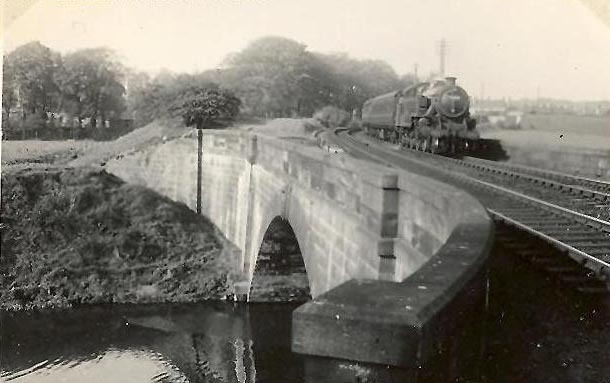 My old neighbour has a picture of a steam train crossing the bridge between *kinda* Cross Road and Victoria Road the bit on the Cross Road side is now flats but Victoria Road still has the bridge embankment. I doubt there is much beyond since they built the abortion that is Victoria Gardens. If you then go up to Stoney Brae area you rejoin the track bed and just off the beaten track is an old bunker. I will visit both my old neighbour and my brother and obtain documents. Brilliant piece of work HH and the sort of thing that restores your faith in this forum (which in my case I have to admit was beginning to flag somewhat). I have a particular interest in the Bellahouston/Dumbreck and Mosspark/Cardonald areas, so if I can find anything relevant that you haven't already covered I will post it up here. Have to agree with everyone - good work! I've been doing a lot of research on the canal over the past few years. I live about 1/2 mile from the Half time school, and ended up working on the reseach for the M74 Extension Archaeology which included work on the Canal at Port Eglington. Got some pics of the Port Eglington site somewhere, will put them up when I find them. 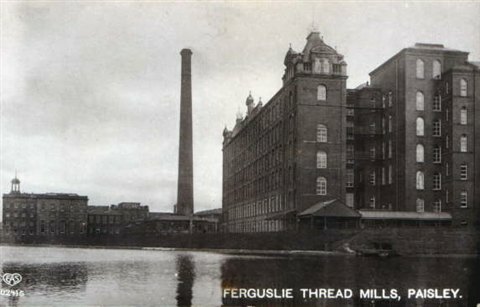 I've got a talk coming up in Paisley on the 8th April - "Renfrewshires connection to Glasgow" which will feature the canal a few other things! Where is your talk being held? it's in the Lecture Hall in Paisley Museum. 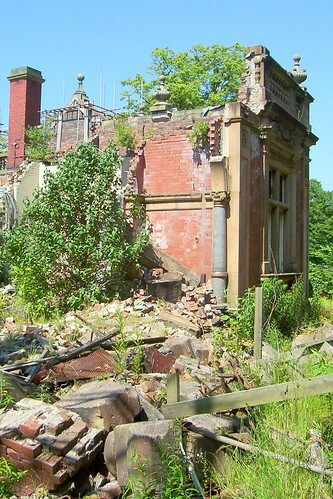 Full details on the RLHF: Archaeology Sections pages. So, if I join up, I can attend the lecture?